Microfluidics or lab-on-a-chip (LOC) is an important technology suitable for numerous applications from drug delivery to tissue engineering. 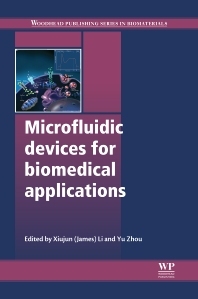 Microfluidic devices for biomedical applications discusses the fundamentals of microfluidics and explores in detail a wide range of medical applications. The first part of the book reviews the fundamentals of microfluidic technologies for biomedical applications with chapters focussing on the materials and methods for microfabrication, microfluidic actuation mechanisms and digital microfluidic technologies. Chapters in part two examine applications in drug discovery and controlled-delivery including micro needles. Part three considers applications of microfluidic devices in cellular analysis and manipulation, tissue engineering and their role in developing tissue scaffolds and stem cell engineering. The final part of the book covers the applications of microfluidic devices in diagnostic sensing, including genetic analysis, low-cost bioassays, viral detection, and radio chemical synthesis. Microfluidic devices for biomedical applications is an essential reference for medical device manufacturers, scientists and researchers concerned with microfluidics in the field of biomedical applications and life-science industries. Assistant Professor, Department of Chemistry, University of Texas at El Paso and at the Harvard University and Wyss Institute.Professor Li is recently rewarded with the UT System STARS Award ($250,000). The STARS (Science and Technology Acquisition and Retention) program provides funding to help purchase state-of-the-art research equipment and make necessary laboratory renovations to encourage faculty members to perform their research. Yu Zhou, PhD, is a Research Scientist in the Department of Research and Development at ABS Global Inc., USA. Dr Zhou received his Ph.D. degree in mechanical engineering from University of Illinois at Chicago in 2010. After graduation, he joined ABS Global, the world-leading genetics provider company as a key researcher and has been working on the development of a high-throughput microfluidic cytometry for biological cell detection and manipulation. He obtained extensive experience in design and fabrication of silicon-based microsystems and disposal plastic microfluidic chips, precision fluid delivery, and microfluidics-based single cell separation and analysis. He is a member of ASME and serves on the advisory editorial board for several technical journals including Microsystem Technologies, and Journal of Mechanical Engineering Research (Canada) since 2011.